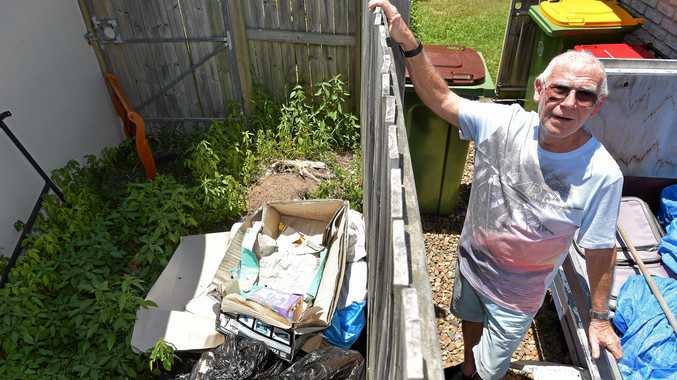 THROUGHOUT the longest, hottest days of summer, Hans Peupelmann has had to put with the disgusting stench of his neighbours' rotting rubbish stacked on his fence. But Mr Peupelmann can't ask his neighbours to clean up their trash. It's a housing commission home and its occupants haven't been seen for six weeks. And his attempts to get the Department of Housing and Public Works to take ownership of the problem have gone nowhere. He has been told by the Housing Department to "get in touch with the neighbours". "But I have no idea where they are," Mr Peupelmann said. He has also contacted his local member, Mark McArdle, who forwarded the message to the Housing Department. Meanwhile, the number of cockroaches, crows and magpies attacking the garbage increased daily. The smell arising from the bags, which are dumped near his bedroom, got so bad he contacted the Department of Public Health. "They said I have to go to the housing commission," he said. "They say there are certain laws in place and they have to give notice of 28 days. "But nobody is there, haven't seen anybody for over six weeks. "It is unhealthy. Somewhere along the line, someone has to be accountable." Mr Peupelmann bought in the area as it looked like a "very nice area to live". "It is opposite a park, we are all mostly retired and we keep our lawns immaculate." He didn't expect his neighbours to do the same, but he did expect them to make some kind of effort. "They need to get rid of the rubbish and the weeds in the yard are a metre high." He couldn't understand why people blessed with low-cost housing, such as a housing commission home, didn't attempt to look after it. "I don't understand why people don't appreciate what they have got," he said. "It's a very nice house, a four-bedroom house. If it were with a real estate agent, they would be doing something in a day." The Daily has contacted the Department of Housing, but no response was received by deadline.